A rendition of what the Trail’s End monument will look like upon completion. Following the Civil War, large Texas cattle drives herded longhorns north, up the eastern edge of the Indian Territories to reach the Pacific railheads in Missouri for shipment east to the packinghouses. Maverick cattle worth only two dollars in local Texas markets could be sold for twenty, even forty-dollars a head up north at the railheads. Enterprising Texans decided it was worth the risk to round ’em up and head ’em out across 700-to-1,000 miles of wild, often lawless country to the rail heads up north. These cattle drives were the confirmation of America’s entrepreneurship. 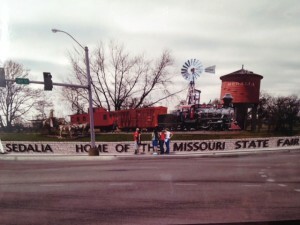 It may have been short lived for only a year or two, but it’s pretty much why Sedalia exists. That’s why a monument is being created at the fairgrounds. The monument will features full size replicas of a 1870s cattle car, water tower, windmill and locomotive set in a landscape of native prairie grasses and flowers. These elements highlight the role of the railroad in the founding of Sedalia, in the commercial development of the prairies and in the drive to connect our nation as one. It was the building of transcontinental railroads that linked the United States from the Atlantic to the Pacific oceans – from sea to shinning sea. Dale Yelton, Co-Chairman of the Trail’s End board talks with us about the project. The dates: April 24, 25 & 26, 2015, including the dedication of the Trail’s End Starline Brass Plaza! !